The following tutorial will step you through how-to install Shareaholic on Blogger. We wanted this document to be comprehensive, providing with you with copy/paste code that you can paste right into your Blogger templates. To save you time, this document covers every case we could think of, which is why it is so long, most installations are straightforward and can be completed within 15 minutes! If you have not already signed up for Shareaholic, check out the Getting Started with Shareaholic Guide before following the instructions below. 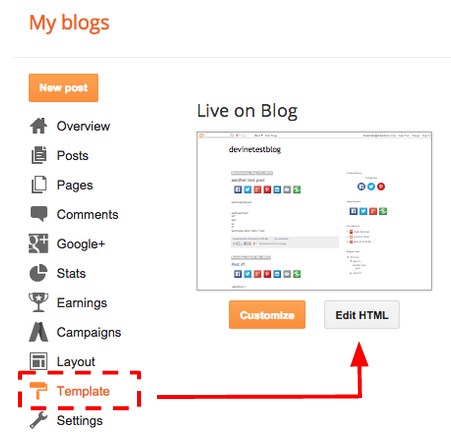 Within Blogger, click Layout from the left-hand side menu. Click on any of the Add a Gadget links within the layout. Paste in the Shareaholic setup code from the Shareaholic.com dashboard into the Content section. If you would like, you can provide Shareaholic with more information about your content. This is done via Shareaholic Content Meta Tags and used by Shareaholic apps such as Content Analytics, Related Posts, Share Buttons, etc. You can learn more about them here. Shareaholic In-page Apps are special apps that let you place them exactly where you want in your website layout or template at the location where the app should be displayed. In-Page Share Buttons, In-Page Related Content and In-Page Follow Buttons are examples of Shareaholic In-Page apps. If you have not created an In-page Shareaholic App, check out the Installing an In-page Shareaholic App Guide before following the instructions below. First, create a new In-Page App instance (for example - Share Buttons, Follow Buttons, Related Content) in your Shareaholic dashboard. Login to your Shareaholic account and select a Site Profile from the My Sites drop-down at the top of the page. On your 'Apps' dashboard, under 'Social Sharing', you'll find the Share Buttons section. Similarly, you'll find the Related Content and Follow Buttons sections. Click New In-Page App. Give a name to this new app location. Choose a name which makes sense for you. Something like 'Post Above Content' would be a good name. Edit the look and feel of the app and click Save. Copy this code to your clipboard. These instructions are for adding a Shareaholic In-Page App to the TOP of your Blogger posts. Instructions for how-to add an app to the bottom of your posts are in the More Placement Options section below. Make sure you are clicking inside the HTML template before trying to search, or else you will not be able to find it. Your search bar should look like the one in the screenshot below. This line of code may appear more than once, so make sure you are putting the code in the right location! Note: Depending on your site's theme, you may have multiple "post-header" located in your template. Make sure you are inserting the snippet code after the correct <div class='post-header-line-1'>, or else share buttons will not appear. The correct line should be the one furthest down the template. Directly beneath that line, press enter to create a new line. Be certain that the Shareaholic <div …> ends with a “</div>” when you paste it in. Click Save Changes to apply this code to your and you're done! If your Blogger theme template has separate code sections for mobile and desktop, you may find this multiple times. Make sure to insert the In-App code for each case! If you're unable to see your app appear, make sure that there isn't another "post-header-line-1" in your template that you missed. While you should only have to place it once in the last location of the tag, there should not be any ill effects from placing the code below all the post-header-line-1 tags, so don't worry about repeating yourself! Press Enter to create a new empty line. Paste the Shareaholic In-Page App HTML code snippet into the empty line. Be certain that the Shareaholic <div …> ends with a “/>” when you paste it in. Press the Save Changes button to apply this code to your site. Select Layout from the menu to the left. Determine where you would like the In-Page app to appear. Paste the Shareaholic In-Page App HTML code snippet into the input box. Note: For In-Page Share Buttons, if you would like to specify the link that should be shared, see this article. After customizing, press the Save button. Once you have finished adjusting your layout, press the Save Arrangement button to apply your changes. Note: Although Shareaholic is compatible with almost all standard Blogger themes (limited support for Dynamic Views), we cannot guarantee compatibility with custom templates. If you are concerned that your template may not be compatible, try using any of the above methods to install an In-Page Share Button app for testing purposes. Share Buttons should be immediately visible once the Setup Code and the In-Page app's HTML code has been applied to your blog. Click Yes. Show mobile templates on mobile devices. Then click on the dropdown menu under Choose mobile template and select Custom. Now Shareaholic will show on both your Blogger desktop page and the mobile site. Note: If you have separate blocks in your theme targeting mobile and desktop, make sure to include your In-page Shareaholic App code in both places.